Sunday Poll: Should Mayor Krewson Be Pushing For A Change To Federal Immigration Policy? June 10, 2018 Featured, Politics/Policy, Sunday Poll Comments Off on Sunday Poll: Should Mayor Krewson Be Pushing For A Change To Federal Immigration Policy? r local economies and participate robustly in civic life. This is why we are members of Cities for Action, a national coalition that advocates for inclusion of immigrants into our communities to create stronger, safer, and more prosperous cities. Our coalition includes over 175 mayors and county executives, representing over 70 million residents, including 17 million foreign-born residents. The 1.3 million young undocumented immigrants enrolled or immediately eligible for the Deferred Action for Childhood Arrivals (DACA) program contribute an estimated $2 billion a year in state and local taxes to economies like ours. DACA-eligible residents pay an average of 8.9 percent of their income in state and local taxes. Sunday Poll: Was The Last Few Months Designed To Force Eric Greitens To Resign? June 3, 2018 Featured, Politics/Policy, Sunday Poll Comments Off on Sunday Poll: Was The Last Few Months Designed To Force Eric Greitens To Resign? Sunday Poll: Will New Crosswalks Improve Pedestrian Safety? May 27, 2018 Featured, Sunday Poll, Walkability Comments Off on Sunday Poll: Will New Crosswalks Improve Pedestrian Safety? Regular readers know I’ve often blogged about crosswalks, so it’s no surprise I was interested in a story last week on improvements to three crosswalks on Grand where it runs through the Saint Louis University campusL: Laclede. Lindell, and the point between those two. Sunday Poll: Is Doug Vaughn Right About St. Louis’ Riverfront? May 20, 2018 Featured, Sunday Poll Comments Off on Sunday Poll: Is Doug Vaughn Right About St. Louis’ Riverfront? In a trio of segment KMOV’s Doug Vaughn has commented on the St. Louis riverfront — both immediately North & South of the Arch ground. In short, he feels the large vacant buildings, old train trestle, etc are eyesores that should be razed. This poll will close automatically at 8pm tonight. Wednesday I’ll share my thoughts on this subject. Sunday Poll: What Is The Ideal Number Of Wards/Aldermen For The City Of St. Louis? May 6, 2018 Board of Aldermen, Featured, Sunday Poll Comments Off on Sunday Poll: What Is The Ideal Number Of Wards/Aldermen For The City Of St. Louis? 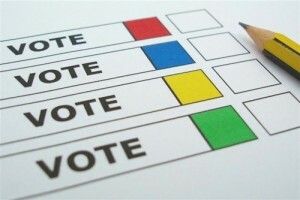 In November 2012 voters approved Proposition R to reduce the number of wards from 28 to 14, based on the 2020 census. Recently a bill was introduced to the Board of Aldermen that, if passed, would ask voters to reverse their 2012 decision. For the purposes of this poll assume one alderman per ward. This poll will close tonight at 8pm.